The world of Hornblower Fan Fiction, and Archie's place in it. The phenomenon of fan fiction arises from an audience's need for more than whatever the film, TV show, book, etc. is providing. We want to know what happened before, what happened after, what happened in between. Fan fiction satisfies the craving for further adventures, explores new territory, develops characters and relationships, fills in gaps, corrects perceived errors, and even (in extreme cases) "un-kills" beloved dead characters ... (hint, hint). Above all, fan fiction is written out of love, not for profit. The various backstories fanfic writers have provided for Archie. The various women whom fanfic writers have provided for Archie. The various injuries and tortures fanfic writers have provided for Archie. The various resurrection scenarios fanfic writers have provided for Archie. More "gen" Hornblower fanfic featuring regular appearances by Archie can be found on the A&E Message Boards, Sarah B's Horatio Hornblower Fan Fiction Site, and Hornblower Fan Fiction Hosted by The Duchess' Daughter . 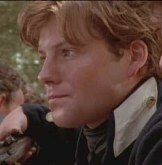 There is a substantial amount of Hornblower slash out there as well. While not for all tastes, it is still Hornblower fanfic any way you slice (slash?) it. But I don't feel particularly up to getting toasted in the middle of a flame war on the subject, so I'm just mentioning it here with the assumption that interested parties will know where/how to look.